January 21, 1936 marks the date when the very first library for African Americans in Lowndes County was opened. Housed in the Walton Building, in a room given by the City Council. It was managed by Luretha Gilmore, the system’s first African American librarian. A heavy loss of books was among the reasons that led to its closure in February of 1939. 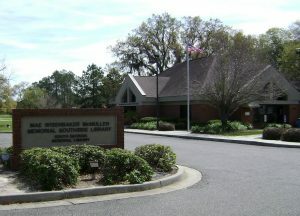 It would not reopen until 1955, when the South Georgia Regional Library System would once again expand to extend services to the African American community. Its new home known as Branch No. 1, located in the community building of the Hudson Dockett Housing Project, was managed by Adelle Lee. She was succeeded by Fuleria Gertrude Manning in 1961. By this time, with the purchase of a second bookmobile, the collection was being shared with African-American schools in the region. Historical documents record 1963 as the year library facilities became integrated. Branch No. 1 relocated to the Carnegie Library in 1968, and was temporarily housed at Lomax Junior High School from 1976 to 1979. In 1979, Branch No. 1 moved to the Corbett Building and was renamed the Central Avenue Library. is home to an impressive African American book collection and state of the art technologies available. This library's strengths lie in its Internet computer availability and its vast collection of African American books and special annual events. Just take a look at this! Fall FunFest: Held annually in October. A literary alternative to Trick-or-Treating with stories, games and prizes. Juneteenth Celebration: Held annually in June. A multi day event that strives to educate the public about the history of Juneteenth. This is a family affair, complete with entertainment. Children's Toy Drive: Held annually in December. Arts and crafts and more! Kwanzaa: Held annually near the end of December. This event highlights the 7 Principals of Kwanzaa.